As entropy increases and a Great Darkness spreads throughout E-space, the TARDIS arrives on the power-devoid planet of Apollyon where a scientist named Pallister guards the only remaining exit from the universe, a mysterious portal that requires the energy found within living tissue to function. With death or sacrifice seemingly the only way out of E-space as the Sandmen approach, the Doctor and his companions find themselves in a harrowing race against time that unfolds in a rather unique perspective. 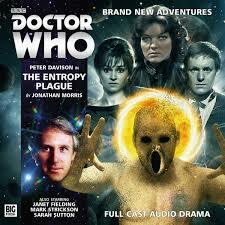 ‘The Entropy Plague’ is a narrated story with the Doctor, Tegan, Turlough, and Nyssa each telling his or her perspective of events to Adric over the course of an episode. This actually works exceedingly well and allows a much more intimate and personal affair than is usual, giving each character a chance to shine as different pieces of the puzzle slowly slide into place. Big Finish has proven with this trilogy that its writers have finally found the means to balance such a large TARDIS crew, and this format proves that there could still be great variation to be had with them if the story hadn’t opened with the distressing fact that Nyssa’s time in the TARDIS is at an end and that she will never see her children again as she puts her altruism once more before herself. With a deadly disease ravaging E-space and her rejuvenation permanently reversed, Nyssa once more sacrifices her freedom for the greater good, providing a fittingly powerful performance as the weight and consequences of her selfless decision manifest. Writer Jonathan Morris creates a wonderful environment for this tale that revels in entropy’s effects, the shanty town where denizens from all over E-space have congregated to party as the end of everything approaches under the glow of a red sun providing a particularly striking image. The Entropy Plague is the great fear of E-space, known in some places as the Wasting and in others as simply death, leaving decay of places and people in its wake. Its victims not always fatally afflicted, the plague’s Sandmen are an incredibly chilling creation and increase the fear and danger of the situation immensely as the infection continues to spread. The sound design here is exceptional, bringing to life the dying world clinging to one last vestige of hope superbly. With the situation so serious as even the TARDIS becomes powerless, the four leads are put into incredibly emotional situations and the resulting honesty as inner sentiments surface is powerful and impactful. Although it is Nyssa who ultimately sacrifices herself to provide a power source for her friends to escape, it’s quite fitting that the Fifth Doctor would offer to do the same, and the level of remorse in Davison’s voice as he recounts the loss of Nyssa is profoundly effective in showcasing the deep fondness his Doctor held for her. Tegan, in a sense, provides her usual no-nonsense opinions, but her questioning of how Nyssa could sacrifice the potential to see her children again for E-space’s people whom she does not know certainly does ring true. Even Turlough has moments of heroism here, though it’s amusingly perfectly in character that he would be the one to bring up the potential of a sacrifice of one for many, of course not offering himself to fill that role. ‘The Entropy Plague’ is an incredibly deep and satisfying tale that perfectly wraps up both the E-space and older Nyssa arcs. The desperation pervading events elevates the performances of everyone involved, and the emotion, imagery, and expansive ideas on display once more prove that audio Doctor Who can be every bit as satisfying as televised.